A.G Roehrig & Son continue to maintain their business reputation online by following up with clients using RepCheckup. 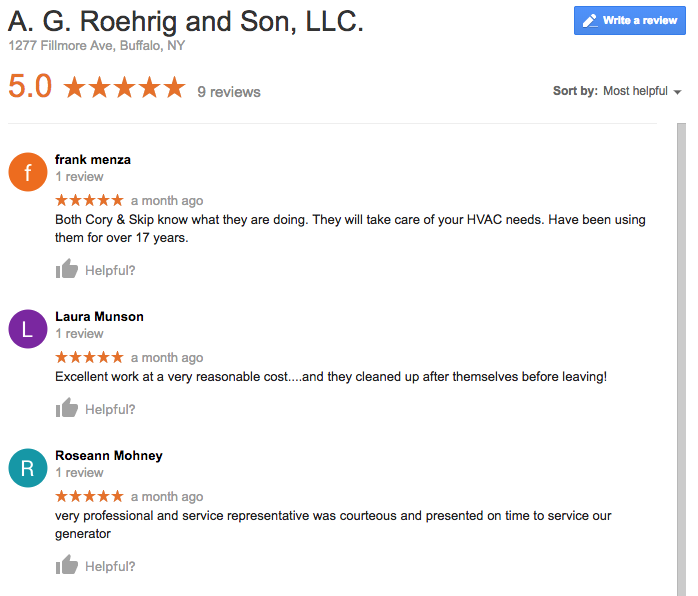 A.G. Roehrig & Son is a local Buffalo HVAC contractor that fits within the business category of on-call services, a vertical that Google has identified as “high risk” for scammers and other problematic online activities. As a business that has been serving customers since 1929, the reputation of A.G. Roehrig & Son is a top priority. The problem? After 88 years of business, AG Roehrig & Son didn’t have an established online reputation. Though this is partially because the internet didn’t exist in 1929, the lack of reviews left for A.G. Roehrig & Son stemmed from customers simply not realizing that they should be leaving reviews. So, despite having a growing customer base, the men behind A.G. Roehrig & Son were looking for a way to expand their business through establishing their reputation online so that the quality of their service was reflected accurately online. Understanding the nuances of working with well-established local businesses, RepCheckup was able to access the needs of A.G. Roehrig & Son to implement a reputation management strategy that would work for their busy schedule. “I’m out of the door at 6am and don’t come back until 6pm, so when I hear new customers tell me that they read about us on Google, I know this tool is working for us,” Cory explained. Because RepCheckup allows business owners like Cory to view and respond to all of their new reviews from one centralized dashboard, there’s no need to spend additional time logging in and out of different platforms to monitor what’s being said about you online. Additionally, the data provided on this dashboard allows business owners to see how many people are actively clicking-through and if someone has privately voiced their concerns rather than posting them publicly. RepCheckup allows business owners to directly interact with customers through their most accessible devices, their cellphones and email, to increase the likelihood of a review being left. 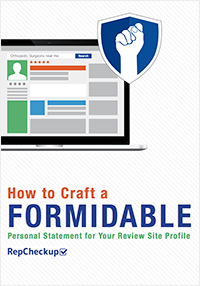 Because these messages are sent directly to cellphones, customers are able to follow the entire review process seamlessly without needing to go on their computer, log-in, and then leave a review. Since starting with RepCheckup, A.G. Roehrig & Son was able to increase their Google reviews from 0 to 9, solidifying their 5.0 rating while constantly soliciting more honest reviews from customers. With more customers calling in after seeing their good reputation on Google, A.G. Roehrig & Son have seen firsthand the benefits of using a tool like RepCheckup, which works on behalf of business owners to save time and ensure the reputation of their business is accurate.